The apocryphal book of 2 Esdras is included in many English translations of the Bible, although it is not generally recognized as canonical by Jewish, Catholic, Orthodox, or Protestant groupings. The book as it currently stands claims to be written by Ezra, the great Jewish leader and scribe who was instrumental in the establishment the Second Temple tradition after the Babylonian exile of the Jews. However, this Ezra is also called "Salathiel" elsewhere in the book, which could make him the father of the exile leader Zerubbabel, rather than Ezra the Scribe. In any case, although it claims to have been written by Ezra/Salathiel around 400 B.C.E., internal evidence suggests a much later date, probably in the late first century C.E., with other sections added even later. The work is basically a Jewish apocalypse, similar to parts of the Book of Daniel and the Book of Enoch, as well as to Christian works such as the Book of Revelation. It describes seven visions given to Ezra, three of which come in answer to his probing questions about human suffering in relationship to God's justice. Its outlook is profoundly pessimistic, affirming that the vast majority of humanity as well as many Jews will be eternally damned, and that God is avowedly unconcerned about the fate of those who do not obey him. Ezra himself is presented as a paragon of righteousness and asceticism, chosen by God to renew the divine word to the chosen people. Study of 2 Esdras is complicated by the probability that its early chapters—found only in Latin manuscripts but in not Greek ones—appear to be later additions written by a Christian author, prophesying the coming of the messianic "son of God" and God's subsequent complete rejection of the Jews. Some later chapters may also suffer from similar additions, although this is more debatable. Despite these and other difficulties with the text, the bulk of the work is considered one of the gems of Jewish apocalypticism. As with 1 Esdras, there is considerable confusion about the naming and numbering of this book. Some early Latin manuscripts call it "3 Esdras," and Jerome denoted it 4 Esdras in the Vulgate version. In more recent times, the books that Jerome called 1 and 2 Esdras have been called the Book of Ezra and the Book of Nehemiah. The designation 2 Esdras became common in English Bibles, but not universally so. It appears in the Appendix to the Old Testament in the Slavonic Bible, where it is called 3 Esdras. The Georgian Bible numbers it 3 Ezra, with Ezra being called 1 Esdras the book known in most English editions as 1 Esdras is labeled as 2 Esdras. Because of their Christian character, these chapters are therefore generally considered to be late additions to the work from the second or third century. The archangel Uriel acts as Ezra's guide and teacher in much of 2 Esdras. Chapters 3-14, the great bulk of 2 Esdras, represent a Jewish apocalypse in the form of seven revelations given Ezra while he still lived in Babylon. Although Ezra is generally known as "the Scribe," here he is also a great prophet, a virtual new Moses who fasts and prays in the wilderness as he is being prepared by God to renew God's Law to the people. In the first vision, Ezra asks God how Israel can be kept in such misery if God is just. The archangel Uriel is sent to answer the question, responding that God's ways cannot be understood by the human mind. Soon, however, the end of the current world will come, and God's justice would be made manifest. In the second vision, Ezra asks why Israel was delivered up to the Babylonians, and is again told that man simply cannot understand God's ways, and that the end is near. In the third vision, Ezra asks why Israel, as God's chosen people, does not possess the world. Uriel responds that the current state is a period of transition. A description follows concerning the fate of evil-doers—constituting the vast majority of mankind as well as many Jews—compared to the few righteous ones who will be saved. Ezra insistently attempts to intercede for those who are so harshly condemned, but is told that no one can escape his destiny. Throughout these chapters, Ezra wrestles with thorny problems of fairness, justice, and theodicy—why good people suffer and evil prospers if God is both almighty and just. He is especially troubled by the fact that, because the world is populated primarily by sinners, the vast majority of people will suffer eternal damnation. God's answer is that he simply does not care for sinners, but only for those few good people like Ezra. Moreover, because God has predestined from the beginning of creation those who are to be saved and those who are to be condemned, it is not up to Ezra, a mere human, to intervene on behalf of the damned, even when their fate seems cruel to him. No one can escape his fate, and even the prayers of parents begging for the lives of their children will have no effect on the sovereign and almighty God. The remaining visions are more symbolic in nature. The fourth is of a woman mourning for her only son, who is transformed into a city when she hears of the desolation of Jerusalem and its temple. Uriel explains that the woman is a symbol of of the holy city. The fifth vision concerns an eagle with three heads and 20 wings (12 large wings and eight smaller ones). The eagle is rebuked by a lion and then burned. Uriel interprets this vision as referring to the fourth kingdom of the vision of Daniel, with the wings and heads as rulers. The final scene of this vision reveals the triumph of the Messiah over the empire. The sixth vision is of a man, representing the Messiah, who breathes fire on a crowd that is attacking him. This man then turns to another peaceful multitude, which accepts him. Finally, there is a vision of the restoration of scripture. God appears to Ezra in a bush and commands him to restore the Law. Ezra gathers five scribes and begins to dictate. After 40 days, he has produced 94 books: the 24 books of the Hebrew Bible and 70 secret works which he is not to reveal to the masses. This vision is omitted in the Latin translation of the text. Most scholars today suggest that the most likely date for the composition of 2 Esras would be sometime after Titus' destruction of the Second Temple in 70 C.E. 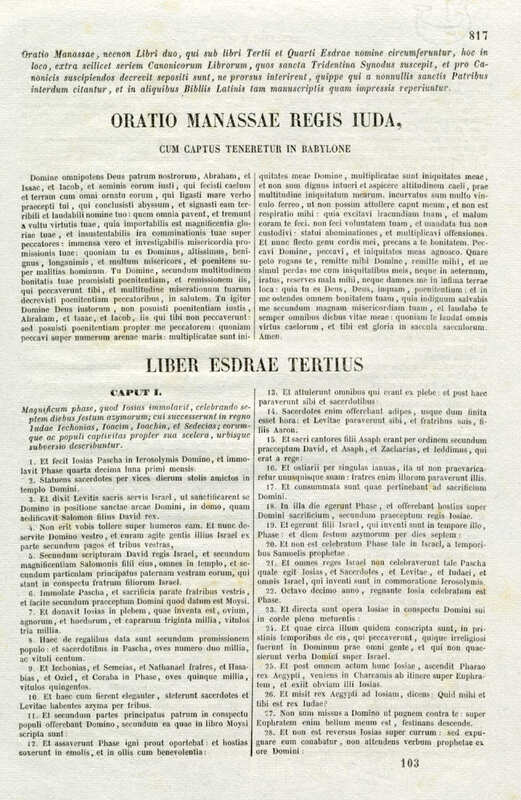 The scholarly interpretation of the eagle of 2 Esdras 5 being the Roman Empire (whose heads might be Vespasian, Titus and Domitian if such is the case) would indicate that the probable date of composition lies toward the end of the first century, perhaps 90–96, though some suggest a date as late as 218. However, critics question whether even the main body of the book—let alone the chapters that exist only in the Latin version—has a single author. Some perceive no less than five hands at work on the text, while others argue that, except for the late Christian interpolations, the book is written by one author. Even the so-called "Christian" chapters are defended by some commentators as representing a Jewish concept of the Messiah as a supernatural being as can seen occasionally in later rabbinical tradition in the Talmud and Midrash. The author seeks answers to large philosophical questions, similar to Job's quest for understanding of the meaning of suffering. However, the writer of 2 Esdras sets his quest in the context of Israel's collective suffering and the issue of mass eternal damnation, as opposed to Job's highly personal and earthly tortures. While for Job the question deals with clearly unfair suffering imposed by God on a righteous man (Job), in 2 Esdras it is why God allows so many people to be eternally damned, and why he has allowed his beloved people of Israel to suffer. The answer, however, is not unlike that given to Job: God is absolutely sovereign, and his ways are not to be questioned by mere humans. Critics have widely debated the origin of the book. Hidden as it is under two layers of translation and probably the work of more than one writer, it is difficult to determine whether the primary Jewish author hailed from Alexandria, Jerusalem, Rome, or some other location. Most Latin editions of the text have a large lacuna (a section of missing text) of about 70 verses between 7:36 and 7:37 due to the fact that they trace their common origin to one early manuscript, Codex Sangermanensis, which was missing an entire page. In 1895 a critical edition was published restoring the lost verses. The restored verses are numbered 7:36 to 7:106, with the former verses 7:37-7:69 renumbered to 7:107-7:137. The last two chapters of 2 Ezra are found in the Latin version, but not in the Eastern Greek texts. These are the chapters predicting wars led by the Messiah (called again the "son of God") and harshly rebuke sinners. Many assume that they, like the early chapters, date from a much later period (perhaps late third century) and may be Christian in origin. It is possible, though not certain, that they were added at the same time as the first two chapters of the Latin version. It is also possible, however, that they are Jewish in origin, as they have been found in some Greek manuscripts which most scholars agree was translated from a Hebrew original. The book is considered one of the gems of Jewish apocalyptic literature. It was also widely cited by early Church Fathers, especially by Ambrose of Milan. While it was not received into most Christian canons, the "Jewish Apocalypse of Ezra"—i.e. 2 Esdras 3-14—is regarded as scripture in the Ethiopian Orthodox Church. The introitus section of the traditional Requiem in the Catholic Church is loosely based on 2 Esdras 2:34-35: "Eternal rest grant unto them, O Lord, and let perpetual light shine upon them." Several other liturgical prayers are taken from the book. Pope Clement VIII placed the book in an appendix after the New Testament with the rest of the Apocrypha, "lest they perish entirely." ↑ Clementine Vulgate, Note to the Appendix Retrieved October 9, 2017. All links retrieved October 26, 2017. This page was last modified on 26 October 2017, at 23:43.